The grip, the shape, and the look, set this pick apart. I've been wanting a plectrum with firmer grip for decades. This is the first pick I've tried that really delivered. For certain kinds of technique, I need to hold the pick quite loosely, even though I need a firm heavy pick most of the time. The grip dots are especially useful for holding the pick loosely without loosing control - or worse, dropping it. Extra grip is also reassuring when switching between different angles or ways of holding it. Even if you don't normally play with sweaty hands, it's reassuring to know that you can handle it should it ever arise when performing. 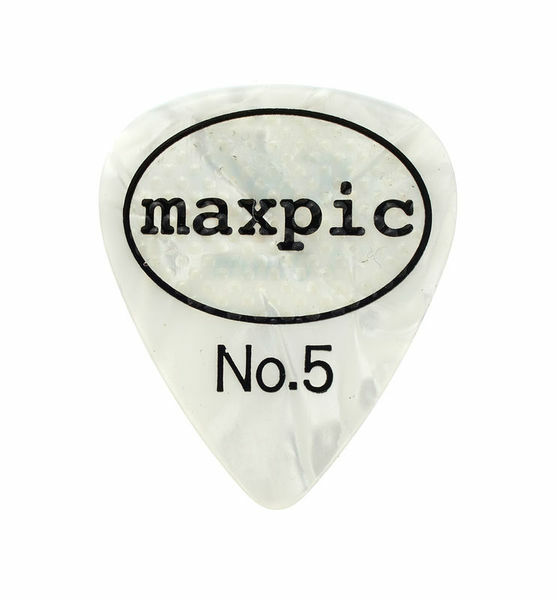 The apex of this pick is slightly narrower than industry standard (i.e. the apex angle is slightly more acute, or the pointy bit is slightly more elongated). I found that this, more than the grip dots, made it feel different playing fast lead parts. It feels somehow more articulate. Once I got used to it and compared to other picks, I find I prefer it. For anything other than fast lead parts, it makes no difference. The mother of pearl effect is nice aesthetically, especially if you have any such pearl hardware on your instrument. On each Maxpic #5/531 I tried, I noticed that the dots were wearing off one by one. After a while, I realised that it was from the corner of my thumbnail. Aside from the grip dots, the surface is glossy and appears to be wear resistant. Once it starts to wear below the surface, it seems to wear away more quickly. Excellent grip based on rubber transparent dots in holding surface, the tone i between dunlop tortex and derlin. ID: 344671 © 1996–2019 Thomann GmbH Thomann loves you, because you rock!